Long ago, Haskap was valued by the Ainu people as an elixir of youth. Haskap in the Ainu language means “Many on top of the branch.” It has a rich flavour that is both sweet and sour. Saint Patrick’s day was last Sunday, something I completely forgot about until I checked my Facebook page and stared wondering why everyone was posting pictures of green things. I like St. Patrick a lot–I mean, he drove the snakes out of Ireland and wears an incredibly awesome hat. St. Patrick’s Day celebrations however seem, like nearly all modern celebrations, superficial and rather meaningless to me unfortunately. That said, when I was child, for St. Patrick’s Day my mother would always make us green eggs and ham, green muffins, mint milk shakes, and pistachio pudding for dinner. I feel that dinner was representative of my mother’s cooking style: strange, but full of love? In Japan, St. Patrick’s Day, unlike St. Valentine’s, is fairly unknown. (Although Buri-Chan talks about the St. Patrick’s festival in charming Matsue in her always interesting blog.) However, four leaf clovers are used all over the place as a cute and easy to depict symbol. 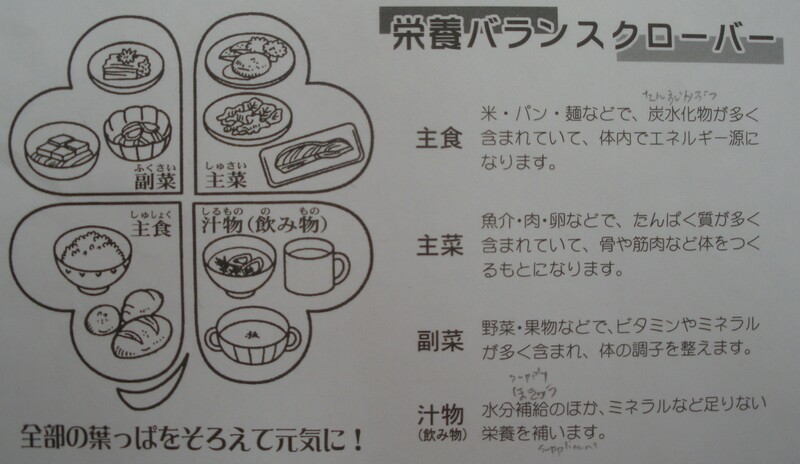 In fact, my lunch menu gives us a four leaf clover as a sort of “My Plate” health symbol. Here I translated it for you! 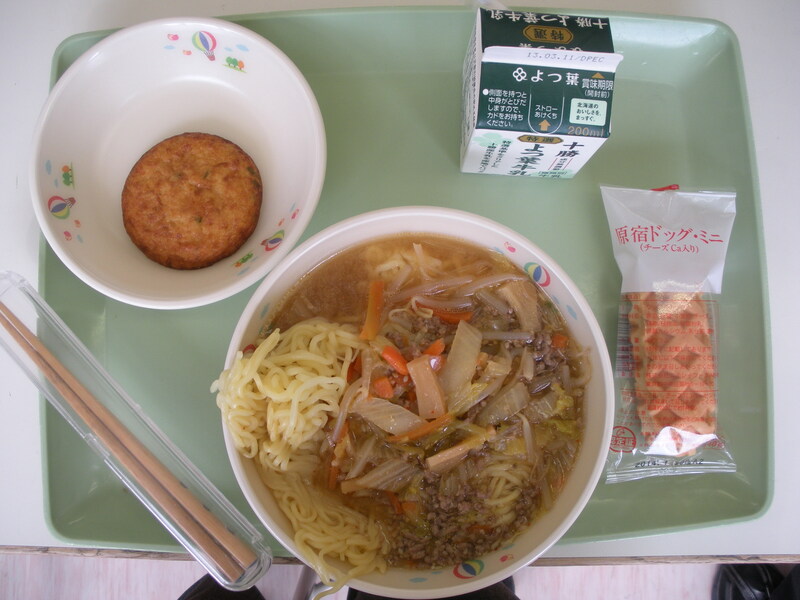 Main Dish: Rice, bread, or noodles etc. that have lots of carbohydrates that give your body energy. Main Side: Seafood, Meat, or eggs etc. that include a lot of protein, which help our bodies build our bones and muscles. Soup (Drink): Besides supplying us with water, it supplements our nutrition with minerals etc. which we cannot do without. The familiar Spaghetti Napolitan! Actually, this dish is a Western dish that was created in Japan. Napolitan refers to it being in a “Naples (in Italy) style” dish. I felt today’s lunch was sort of “ma….”, but that might be because I don’t really like pasta that much. Well…. I did have a thriving passion for Knorr Alfredo pasta mix when I was at university, but that is really more akin to loving cup ramen than it is to liking pasta. By the way, I love noodles in soup, but it is just when noodles are dressed in sauce that I don’t think they are great. Tuesday is always bread day! On bread days, the side dishes tend to be Western style dishes. You can see this easily just looking at today’s menu: a bacon, rather than fish or seaweed, based soup; the very western style Napolitan; and butter, rather than salt or koji, broiled fish. (I should mention though some people thought fish with Napolitan was a very odd combination.) Looking at the calorie count, today’s lunch is not so unusual, but on a whole bread day lunches tend to have a higher calorie count as well. 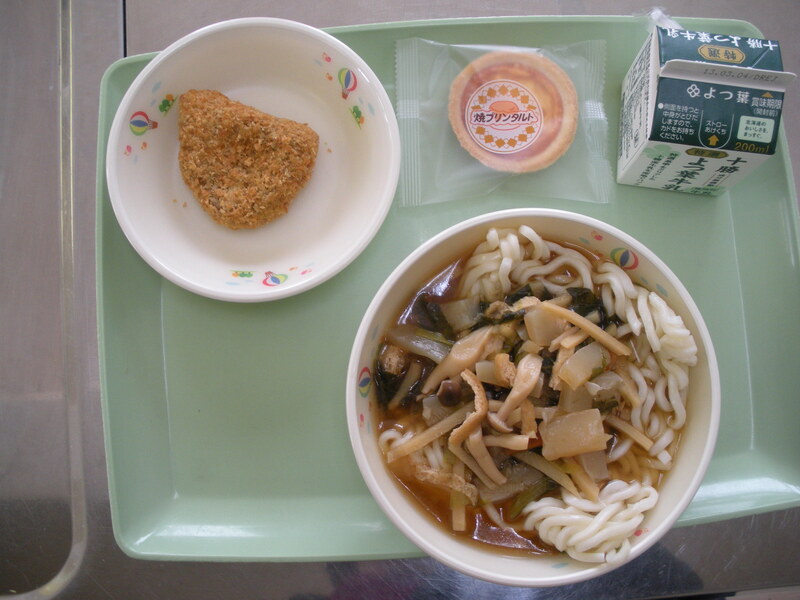 However, I like school lunch bread rolls a lot, and while I adore rice and am happy to eat it everyday, occasionally having bread for school lunch is a nice change. 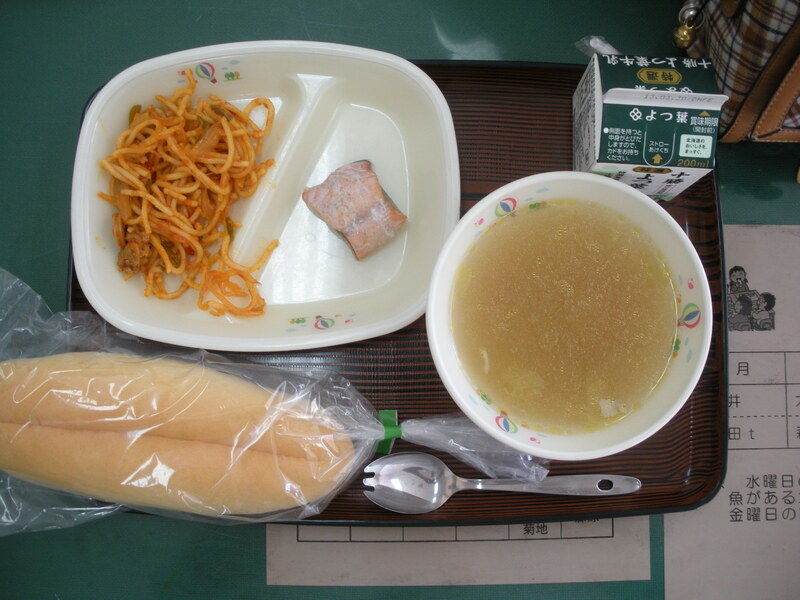 Rice-based school lunches and bread-based school lunches are completely different. Rice school lunches and bread school lunches are not the same. Not only are they different in how they influence our health, but it also has a strong connection to agriculture, the environment, and food culture. Gateau is often requested. The secret to its popularity is its soft texture together with the rich taste from the cocoa bean. Please enjoy it! Today’s salad had a surprising vinegary taste. 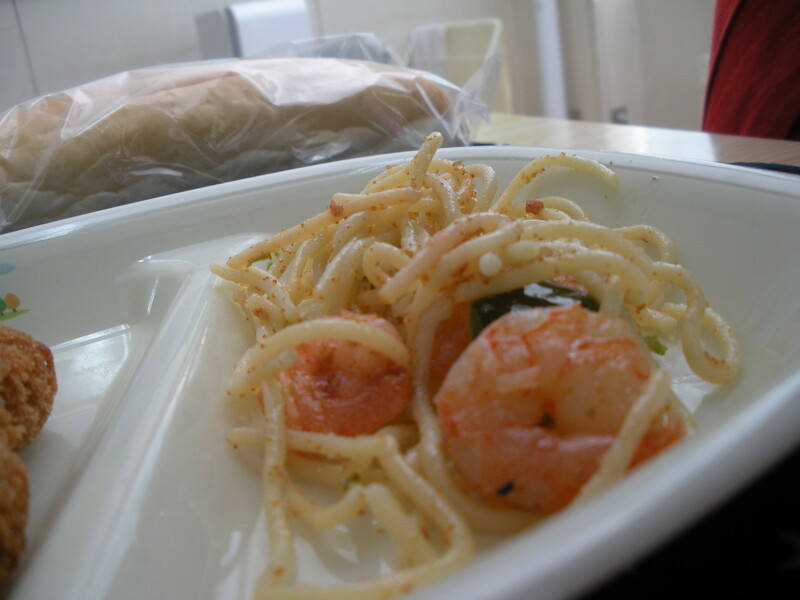 It seemed to be something like ohitashi dressed in an italian style dressing. 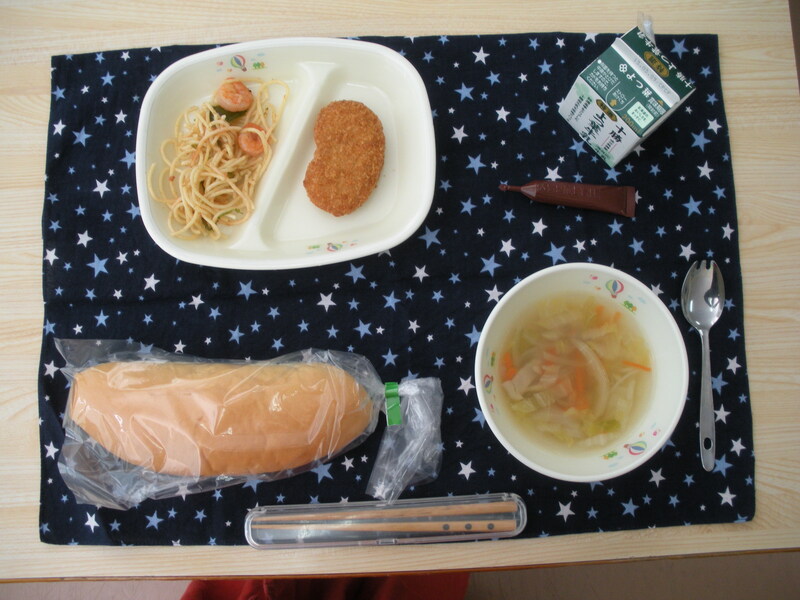 Also, eating it today, it struck me that we never have processed meat in school lunch, which is probably a good thing. As a special treat today, we also had Ito-en tea. I love Ito-en because I used to drink their Oi Ocha every weekend while eating Kinoko-no-yama when I was in university (I had such a nice boyfriend back then!) I asked why we had Ito-en today, and apparently it was a graduation present to the school from the post-office. Yeah, that is how awesome our post-office is. And finally, who doesn’t love Okome de Choco Gateau! Tuesday was the last day for my third years at my Higashiyama school. So as it was the last English class, I was able to hold a tea party for them. There being only six students in the third years also made it possible. There isn’t a strong tradition of tea in my tropical homeland, but despite this, I did my best to throw British style tea party for them. 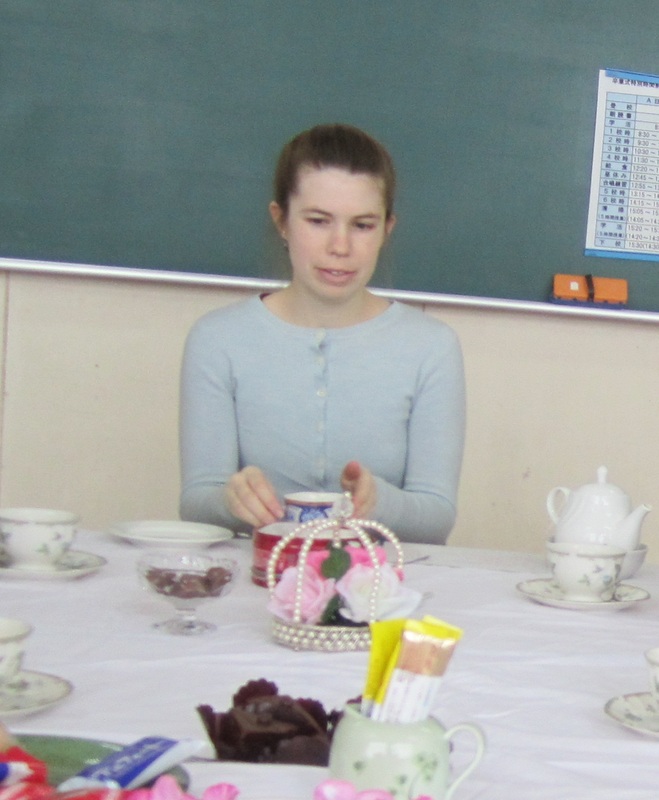 Here I am having Tea with my students. Formal etiquette is something I have always had an interest in; I often used to read this 1960’s edition of Emily Post just for fun. That said I really didn’t learn any sort of etiquette beyond basic table manners at home. While of course my mother would scold us if we chewed with our mouths open or shoveled food off our plates, we didn’t use a knife at dinner, much less learn how to handle one, and eating our peas with a spoon was perfectly permissible. But once I travelled over seas, I realized that lacking the ability to eat in a proper Western manner marks one as a sort of ignorant person. Anyway, my point is that I think playing tea party is a very important part of internationalization too. Finally, I want to say that all the Japanese I have had dinner with have had impeccable table manners. 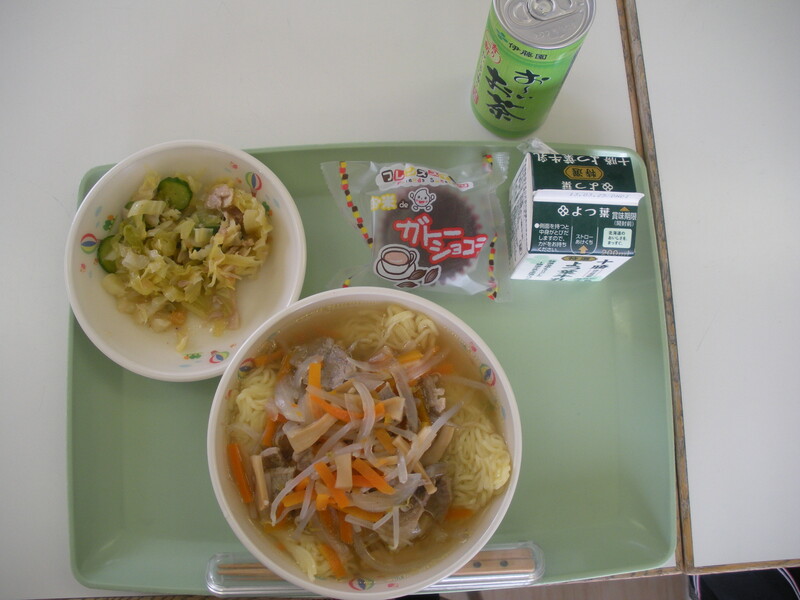 Moyashi (bean sprouts) are the sprouts of bean type plants like soybeans. They include vitamin C, which protects our body from stress and builds our power of resistance against illnesses. Before I came to Japan, I couldn’t say I was very good friends with beansprouts. 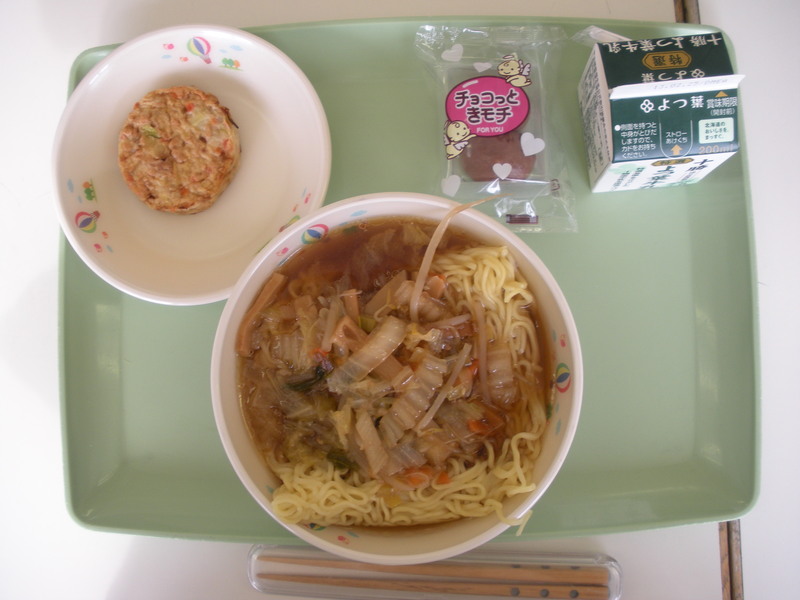 In the school lunch when I was a child, we would have a sort of noodle beansprout dish that I was always a bit dismayed at: mostly because there were more beansprouts than noodles in the dish! Also, I think they weren’t cooked probably maybe, but I don’t clearly remember. Anyway, bean sprouts on a whole have a very poor reputation in America, but actually they are used in all sorts of delicious dishes here in Japan. They are also quite healthy and easy to grow at home, which make them a very wonderful plant. So bean sprouts and I have become friends once again today. Oh and another note about today’s food: note the soup has shark fin in it! Maybe it will make my skin beautiful! The third years got their year books today. In my homeland, all students have the option of purchasing the year book, and the bulk of year book contains portrait photographs of every student, which serves as a sort of record of all the pupils enrolled every year. In Japan, only the third years get yearbooks, and they contain just photoes and messages all about the third years. However, at the Entrance and Graduation ceremony, formal photographs are taken of all the students together, and that in turn serves as a record of the pupils enrolled. The tradition of taking a group photograph goes back to the start and public schooling/photography in Japan. 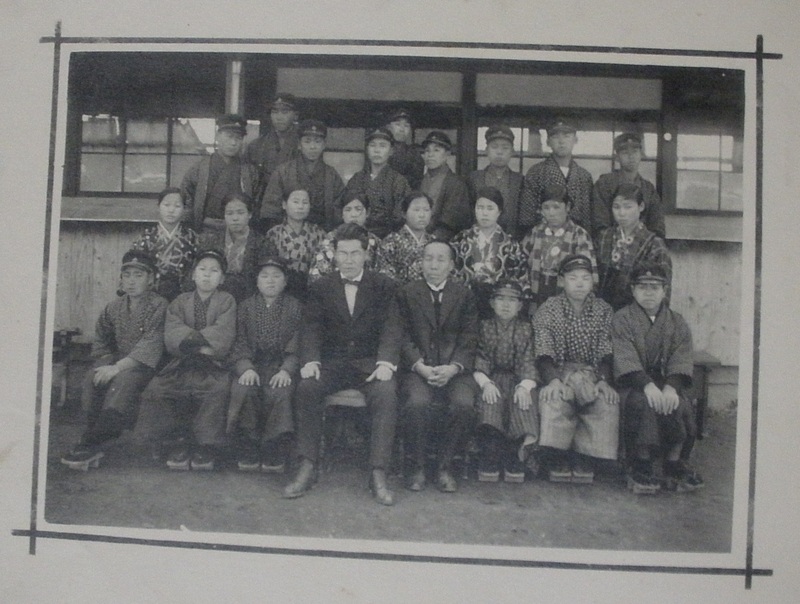 Some of my schools have posted on the wall such group photographs going back to the Taisho period (1920s). It is pretty fascinating to look at them: how the number of students decreased, how the clothing and fashions changed, how the school building changed, and even how the features of the students and teachers faces changed as time progressed through the frontier period, through the war and finally into the modern era. A Year Book photograph from the Taisho Period! From my personal collection. 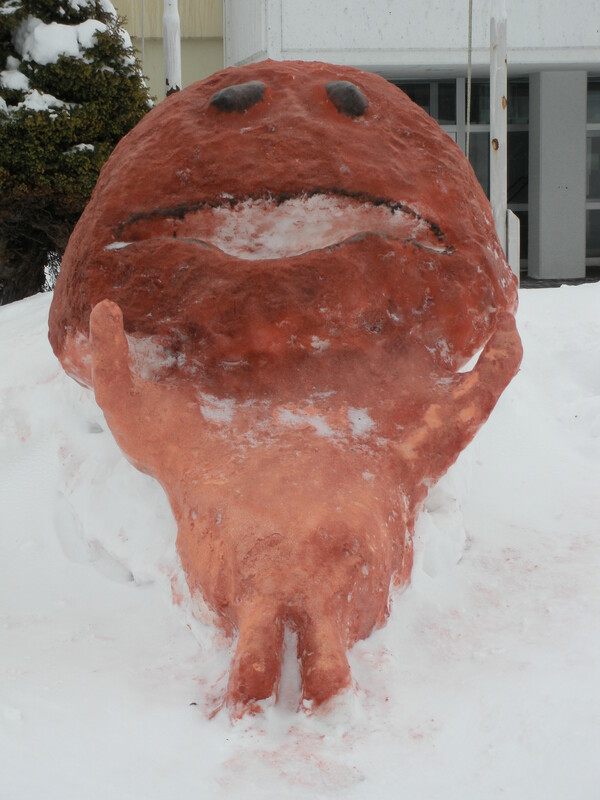 The charming snow sculpture in front of the school made by the students. It is a mushroom character called “Nameko”. The graduation ceremony is soon! Let’s celebrate with feelings of congratulations and gratitude towards the 6th graders who have helped us so much and 9th graders for whom this will be their last school lunch. Namul is a type of Korean dish, but it wasn’t spicy at all: rather it was blanched vegetables seasoning in a vinegary sesame dressing. It was delicious, as the girl next to me pointed out today. We also had cake, which was one of 日東’s Friends Sweets line. It didn’t list the ingredients on the box, but all the other Friends Sweet line are made from local ingredients/rice flour so this probably was too. 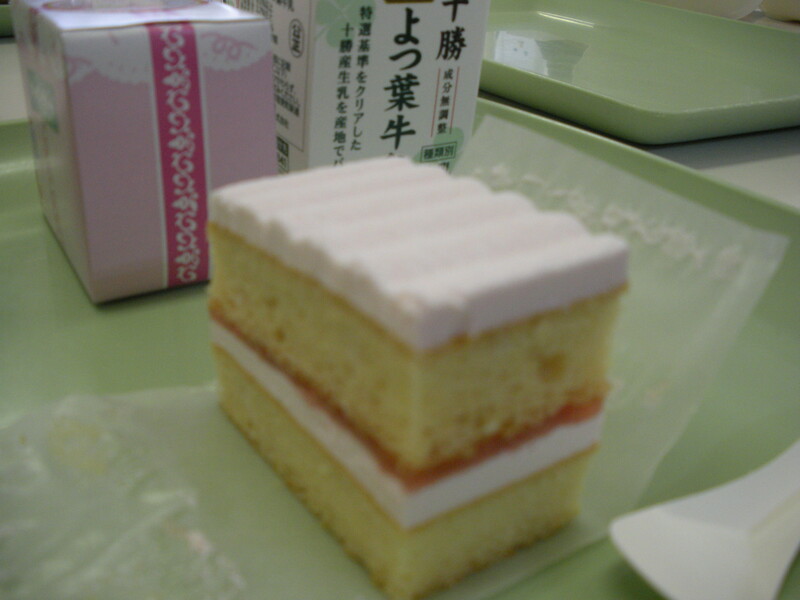 It tasted pretty good, a little bit lighter than a standard Japanese cake. 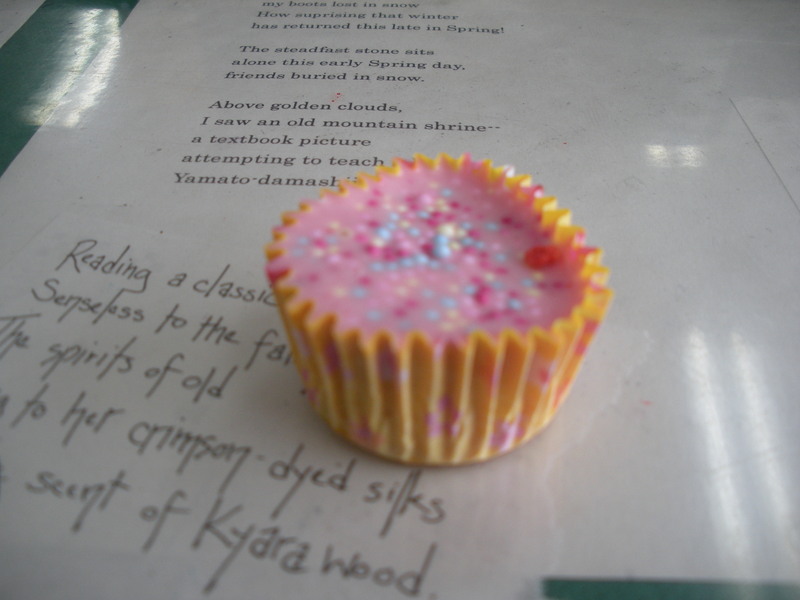 Most of the students liked it a lot, although one of them complained that it was too sweet. I have an insatiable sweet tooth, but it pains me to confess, I don’t like cake so much. I love butter cream frosting. And the bread-like castella variety of cakes are very nice. But a typical white/yellow cake, especially when covered in whipped cream frosting, has nothing to recommend. Please give me a soft cookie, daikfuku, fruit pie, or nerikeri instead. When I was a child, my mother used to make my brother and I (we have the same birthday!) a cake, but once my brother moved out, I started asking for fruit pie instead, and every year we would have apple or some other type of pie. It is only a few weeks until graduation, so we tried our best to serve desserts. Today, at the close of February, we have the calcium rich Cheese Waffle. It’s faintly salty flavour is exquisite! The Cheese Waffle today was technically called a “Shinjuku Dog”. It was like a hot dog, except the bun was a waffle and the sausage was a stick of cheese. The cheese was indeed slightly salty and the waffle sweet, so it was an interesting combination of flavours. The okonomi-age (Fried As You Like) was pretty popular with my students today. One of them commented it tasted like tako-yaki (savoury octopus donuts) and I feel it is a fairly accurate comparison. Today was a smaller school, so during lunch the students hosting the lunch radio program usually interview someone, another student or teacher. Today, they interviewed the English teacher, so she answered some of the questions in English and gave a short speech encouraging the soon to be graduating third-years. So I thought it occurred quite nicely. After lunch, I noticed one of the teachers using a sort of tool at his desk. I asked him about it and it was an electric eraser. He said that when we make a mistake with a pen, normally we use white out to fix it. But we cannot use white out on important documents, so we can use this electric eraser. It works basically by scratching away the thin top layer of a sheet of paper, we have to be careful not accidentally scratch a whole hole through the paper when using it. 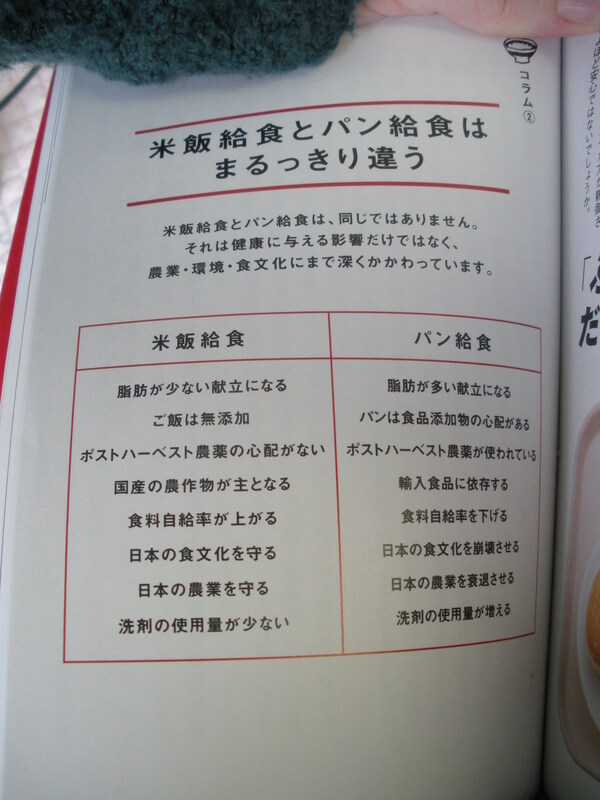 I thought it exemplified a fastidiousness for which Japan is often renowned. “Milk Make” makes its appearance. Squeeze it into the milk carton through the straw hole, but before you do this, take a sip of the milk first to prevent extra milk from spilling out. Then put in the milk make, mix it well, and drink it up. Today’s breaded bean patty had a slightly sweet taste. It wasn’t overly popular with the boys. Previously, when we have had cod roe spaghetti, there were more eggs I felt. 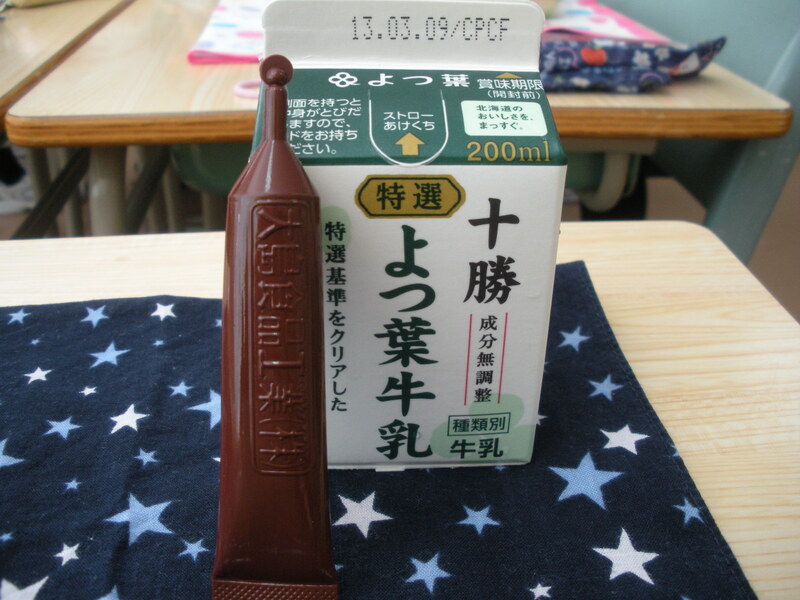 I don’t know where the name for the chocolate milk syrups comes from: literally it is “Mirumeiku” so I thought that sounded like “milk make”. But I don’t know. It comes in a tube that looks just like the tubes of chocolate you can buy for cake decorating. In fact, I wonder if it isn’t practically the same thing. That said, I can’t drink milk, and thus I gave my milk make away, and didn’t drink it. 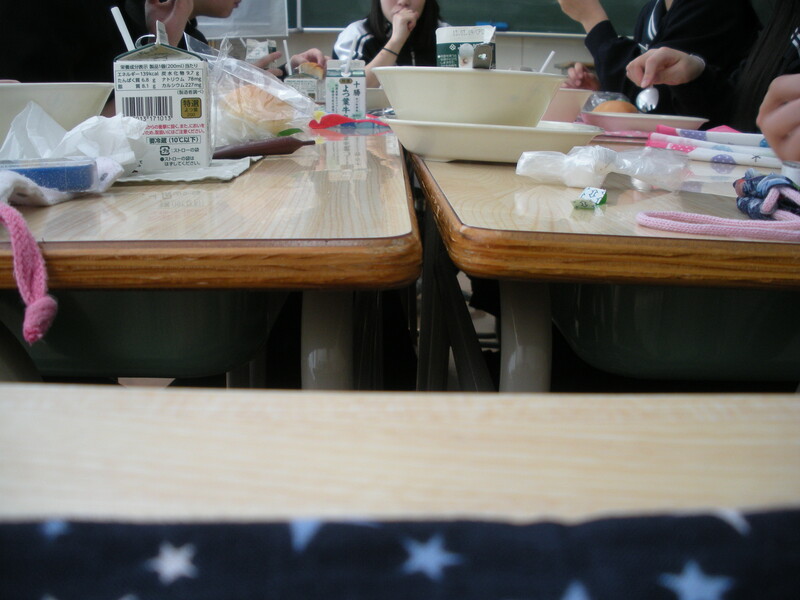 A picture from where I sat at the foot of the table. The much anticipated dessert of today, precisely because it is so rare, is Baked Pudding Tart! It is very often requested. Is the secret to its popularity the suitability between the tart shell and the baked pudding? 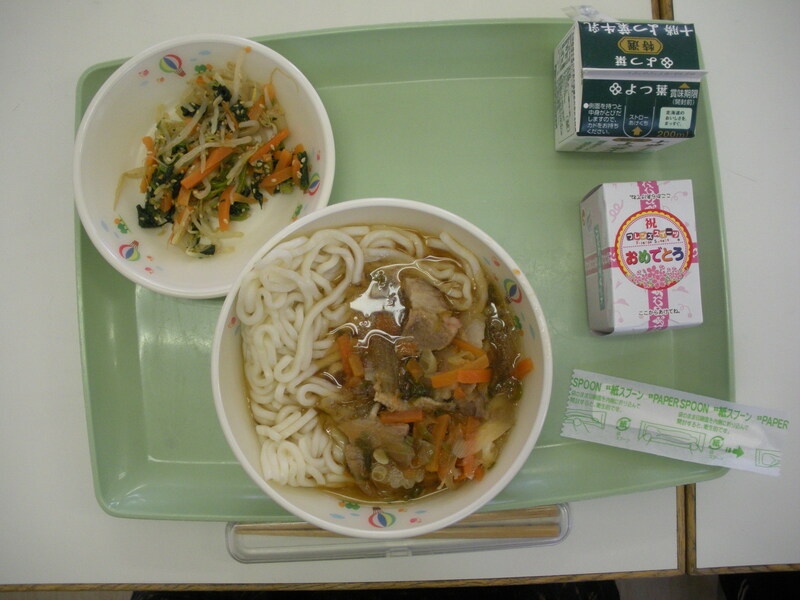 Udon is pretty much always delicious, which its yummy vegetables, light broth, and fat noodles. Nom, nom, nom. The kabocha squash Fry was rather sweet, so I was surprised to know it had mincemeat in it. It seamed mostly kabocha. And of course, the Baked Pudding Tart was chosen as today’s favourite dish during the student radio program during lunch. Excepting elementary schools, I visit seven schools. However all these schools are under the same board of education so the school lunch is the same. But normal teachers must change schools every six years or so. 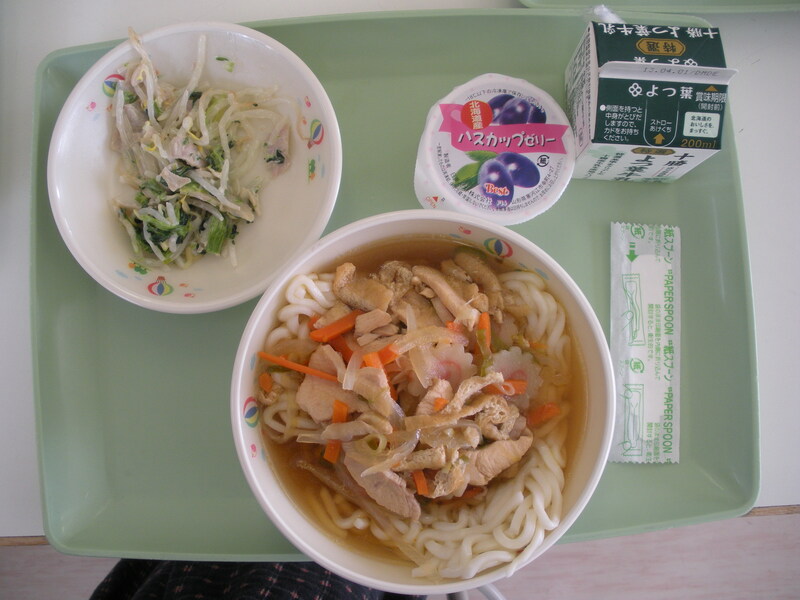 I was speaking to one of my teachers about school lunch and she said that she felt the school lunch in this area was rather on the lower end of school lunch quality, she felt the lunches in Asahikawa and other districts were better. So I thought it was interesting to hear her opinion. Chocolate is made from the seed of the cocoa plant (cocoa beans). Slab chocolate like we eat nowadays was first introduced in 1847, before that chocolate was drunk. The name of today’s dessert is “Chocotto kimochi”, which literally means “a little bit of emotion”. But “choco” and “mochi” are written in katakana, which read together means, of course, “chocolate mochi”. So itis assorted of pun. Today is St. Valentine’s Day and I received some chocolate. One was from one of my students (pictured) and the other was from the head of the Rokugo Post Office. Yeah for living in a small town! There were a couple characters I wasn’t sure about in yesterday’s translation of the curry recipe, so today I was able to ask the Japanese teacher at Rokugo about it. It turns out two were abbreviated characters (トキ and コト) and the other is apparently not understandable even to experts. So thank you Rokugo! 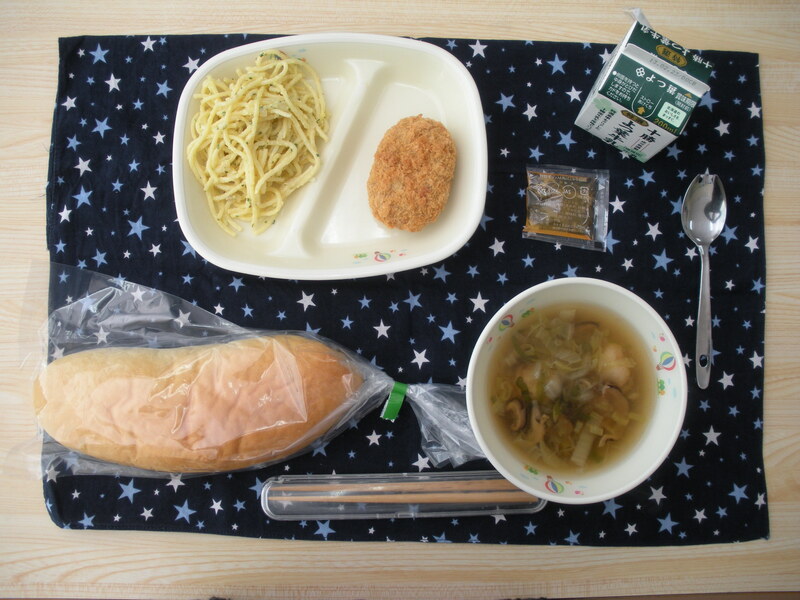 Five spice (goshin五辛) contains garlic, rocambole (nobiru), Japanese leek (rakkyou), onion, and Chinese leek (nira). Because it has a strong smell, it is said from ancient times to clear away pollution and prevent sickness. Last week’s cold was actually Type A influenza. So it’s my first day back to work after being in bed for a week. 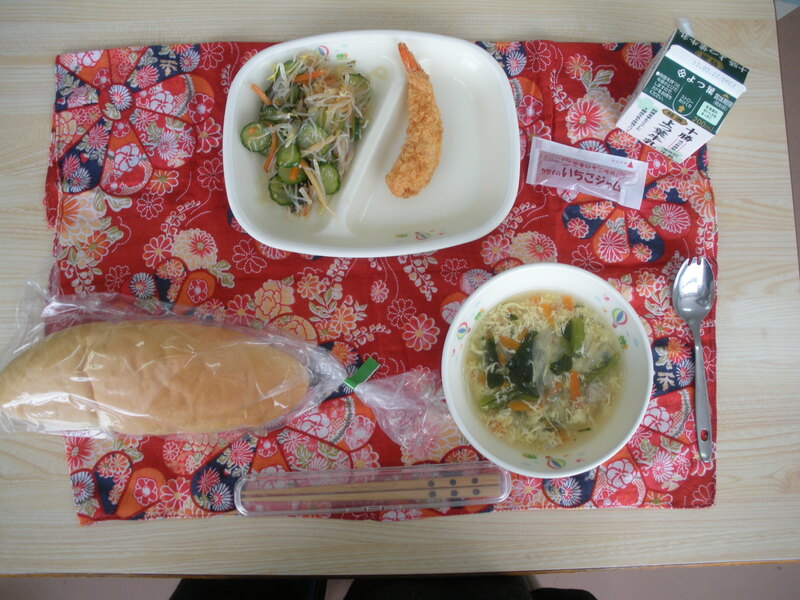 Being all influenza-y for a week didn’t incline me to cook much at home, so it was quite nice to eat school lunch as a change from rice, chikuwa, and tosa nimono. Anyway, tokachi is an area in Hokkaido which is famous for growing beans. I am most familiar with their delicious adzuki beans, but apparently they also grow soybeans. Today’s croquette was quite tasty I thought: not as oily as usual and with a nice soft flavour. Eating it, I thought maybe it was curry flavoured, but rather it must be the Five Spice they used mentioned above. Looking up “five spice” in English, you will find a different sort of spice mixture that seems to be used in China. This “five spice” refers to the buddhist “five spices”, which we are told we should avoid, because they encourage avarice. This is a problem related to modern globalization. Something like this is not likely to occur when the food you consume comes from the same country you live in, much less local farms.